The aetio-pathogenesis of preeclampsia, a complication of pregnancy, is poorly understood. Oxidative stress has been shown to be the causative factor for hyper-tension as well as for target tissue damage in hypertension. Studies that explain the role of oxidative stress in preeclampsia have been few in number. The present study was aimed at (1) determining the extent of oxidative stress in preeclampsia and measurement of lipid peroxidation as a marker of oxidative stress, (2) corre-lation of lipid peroxidation to ceruloplasmin levels and (3) correlation of lipid peroxidation to blood pressure changes and urinary protein excretion during the antenatal period as well as the post-partum period. Thirty women with preeclampsia, thirty normotensive pregnant women (who were matched for maternal and gestational age) and thirty normotensive, non-pregnant women were selected for the study. Lipid peroxidation was measured as malonaldehyde (MDA) levels, ceruloplasmin was quantitated by its oxidase ac-tivity and urinary protein excretion was determined by turbidometry. Lipid peroxidation was significantly increased in preeclampsia when compared to normotensive pregnant women. 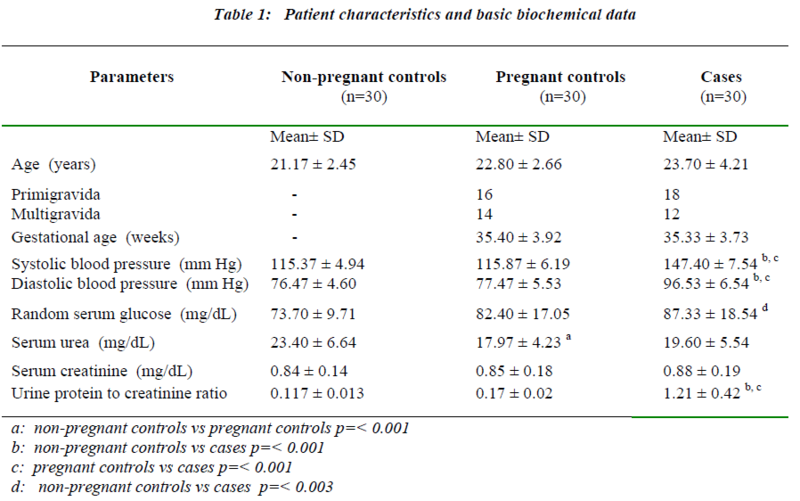 Malonaldehyde levels were moderately increased in normotensive pregnant controls (1.3nM/mL ± 0.15) and markedly increased in preeclamptic pregnant women (2.52nM/mL ± 0.22) when compared to non preg-nant normotensive women (0.91nM/mL ± 0.17). Oxidase activity of ceruloplas-min was significantly increased in preeclamptic women compared to normal pregnant women. A significant correlation was found between the increase in uric acid levels and ceruloplasmin in preeclamptic women. The elevated blood pres-sure returned to normal levels after delivery, but lipid peroxidation and urine protein excretion remained higher than normal, suggesting that factors other than oxidative stress may contribute to the development of hypertension in pree-clamptic women. Oxidative stress, however, plays a very important role in the causation of target tissue damage such as renal injury. Preeclampsia is a progressive, unpredictable and potentially dangerous human pregnancy specific disorder characterised by the onset of hypertension (>140/90 mmHg) and proteinuria after 20 weeks of gestation in previously normotensive, non-proteinuric women. It is one of the most commonly occurring complications of pregnancy, leading to fetal growth retardation, preterm delivery and maternal and fetal morbidity and mortality [1,2]. The aetiology and pathogenesis of preeclampsia remain poorly understood. Increasing evidence indicates that dysfunction of the vascular endothelium accounts for the altered vascular reactivity, activation of the coagulation cascade and loss of vascular integrity that accompanies pree-clampsia [3,4,5]. Recent reports suggest that free radical induced endothelial cell injury might be an etiologic factor . An imbalance of increased oxidant status and decreased antioxidant status in women with preeclampsia has also been noted. Low levels of antioxidants such as the catalase, vitamins A, and E, and glutathione are seen in women with pree-clampsia . Lipid peroxidation seems to play a role in the pathogenesis of preeclampsia, but, the results are conflicting. Few studies do not support the role of oxidative stress in the genesis of preeclampsia . In addition, the role of oxidative stress in the progression of preeclampsia and its associated complications has not been well addressed. Ceruloplasmin is a free radical scavenger as well as a late acute phase reactant protein. It has been shown to be an important antioxidant implicated in the modulation of oxidative stress responses in patho-physiological states such as diabetes mellitus . However, its role in pree-clampsia has not been explained. A Cross Sectional Study was carried out on 30 normoten-sive non-pregnant women and 30 normotensive pregnant women as controls and 30 patients of preeclampsia as cases, attending the outpatient department and wards of Obstetrics and Gynaecology, Kempegowda Institute of Medical Sciences, Bangalore during the year 2003-2004. The diagnosis of preeclampsia was established (blood pressure > 140/90mmHg, proteinuria and edema) in accordance with the definitions of the report of the Working group members of National High Blood Pressure Education program (NHBPEP) . The inclusion criteria for the subjects were age between 18 to 35 years and gestational age between 28 to 40 weeks, singleton pregnancy and absence of any other medical complication concurrent with preeclampsia for the pregnant women. Patients and controls were matched for gestational age, maternal age and parity. Elderly primigravid subjects, gestational diabetics, chronic hypertensives, multiple gestations and those with a family history of preeclampsia were excluded from the study. Subjects included were also non-smokers, non-alcoholics, and not suffering from any acute infections or chronic illnesses. A history of cardiovascular disease, renal disease or any underlying medical disorders (determined by a comprehensive physical examination and routine laboratory tests) or concurrent intake of any drug were the exclusion criteria in the study. The Institutional Ethical Committee approved the study protocol. History and personal physical data was obtained from both cases and controls. After informed written consent, 5ml of venous blood was collected from the subjects. The serum was separated and analysed for malonaldehyde (MDA), ceruloplasmin, glucose, urea, creatinine and uric acid. A random urine sample was collected for urine protein (expressed as protein to creatinine ratio), urine glucose detection and urine creatinine tests. Fifteen women were randomly chosen from among the preeclamptic group. Post partum blood and urine samples were collected from these patients within 5days after delivery; these samples were analyzed for the same parameters as the antenatal samples. Lipid peroxidation was measured by estimating malonal-dehyde (MDA). MDA, a product of lipid peroxidation, reacts with thiobarbituric acid (TBA) to form a pink colored TBA-MDA adduct. This color is measured at 532nm . Ceruloplasmin was quantitated by its oxidase activity. It was measured by its property to catalyze the oxidation of colorless para-phenylene-di-amine to blue or violet colored compounds . Urinary protein excretion was determined by turbidimetric method using sulphosalicylic acid to precipitate the protein . The estimation of serum glucose, serum creatinine, urine creatinine, serum urea and serum uric acid were carried out on Technicon RA-XT autoanalyser using diagnostic reagent kits obtained from Bayer Diagnostics India Ltd. The analysis of variance (ANOVA) was carried out to find the significance of mean values between the three groups. Once significance was noticed, the post hoc test of Tukey and the Chi-square test  were used. The systolic blood pressure values, diastolic blood pressure values, mean values of urine protein to creatinine (PC) ratio, random serum glucose, serum urea and serum creatinine of the study subjects are presented in Table 1. A significant increase in blood pressure was observed in preeclamptic patients compared to pregnant and non-pregnant controls. The urine PC ratio was elevated significantly among the preeclamptics (p= <0.001) when compared with both non-pregnant controls and pregnant controls.There were no significant differences in the values of the urine PC ratio among the two control groups. Serum MDA (malonaldehyde), serum ceruloplasmin and serum uric acid levels expressed as mean ± S.D are presented in Table 2. Serum MDA levels were moderately increased in pregnant controls (1.3nM/mL ± 0.15 p= <0.001 for non-pregnant controls vs pregnant controls). In preeclamptic women (2.52 nM/mL ± 0.22), the rise in MDA levels was more marked. In this group, there was no significant correlation between serum MDA and serum ceruloplasmin levels. However, a highly significant correlation was seen to exist on comparing serum MDA levels to the systolic blood pressure values (p<0.05) (Fig 1) and serum MDA levels to urine protein to creatinine ratios (p<0.05) (Fig 2) in preeclamptic women. No significant correlation was noted between serum MDA and other parameters in control groups. Serum ceruloplasmin concentrations of 20.27mg/dL ± 2.39 were found in the non-pregnant control group. In the pregnant controls, there was a 2.6 fold increase in serum ceruloplasmin values over those observed in non-pregnant controls. In preeclamptic women a 3.2 fold increase in ceruloplasmin concentration was observed in comparison to the non-pregnant group (p=0.001). The rise in ceru-loplasmin levels was significant in the preeclamptic cases when compared to pregnant controls (p=<0.001). Serum ceruloplasmin levels also correlated significantly with serum uric acid levels in the preeclamptic women (p<0.05). No significant correlation was noted between serum ceruloplasmin and other parameters in other study groups. The preeclamptic group showed a marked increase (1.5 fold) in serum uric acid levels when compared with both non-pregnant controls (p= <0.001) and pregnant controls (p= <0.001). The serum uric acid concentrations in both the control groups were not different from each other. The data showing the differences in the parameters of preeclamptic antenatal and postpartum samples of 15 women are presented in Table 3. Systolic and diastolic blood pressure readings showed a significant reduction in postpartum period compared to antenatal states (p= <0.001 for both systolic and diastolic blood pressure).The systolic and diastolic blood pressure levels reached values that are observed in normal pregnant women. The random serum glucose, serum urea and serum creatinine concentrations did not differ significantly between the two groups of samples. The serum malonaldehyde, (Fig.3) showed a 2.1 fold decrease in the postpartum samples when compared to the antenatal samples (p=0.001). However, the serum MDA did not decrease to the levels seen in non-pregnant women. A 1.6 fold decrease in serum ceruloplasmin levels was observed in the postpartum samples compared to the antenatal samples (p= <0.001). Serum uric acid levels in the postpartum samples also fell significantly (p= <0.001), reaching values similar to those in the antenatal pregnant controls and non-pregnant control groups. The fall in the urine protein to creatinine ratios in the postpartum samples are depicted in Fig.4. The decrease in urine protein to creatinine ratios was significant compared to the antenatal values (p= <0.001), though not reaching the values observed in the pregnant controls. Oxidative stress has been proposed as one of the underlying mechanisms contributing to the pathophysiology of preeclampsia. Most studies on oxidative stress in pree-clampsia have reported increased levels of MDA (malon-aldehyde) in serum from preeclamptic women compared to pregnant women [15,16]. In the present study, lipid peroxidation is significantly increased in preeclampsia when compared to pregnant controls. This is similar to the results of previous studies [15,16]. Oxidative stress as a cause of hypertension: Hypertension is associated with an elevation of reactive oxygen species (ROS) and frequently also with an impairment of endogenous antioxidant mechanisms. Experimental manipulation of the redox state in vivo shows that reactive oxygen species (ROS) can be a cause of hypertension . Exposure of cells or tissues to exogenous oxidants mimics events that contribute to the development of hypertension. Generators of superoxide abolish endothe-lium-dependent relaxation of aortic rings from spontaneously hypertensive rats (SHR), induce contraction of mesenteric beds, and increase chloride reabsorption by isolated thick ascending limbs of the loop of Henle [18,19]. In whole rats, infusion of H2O2 in the renal medulla increases blood pressure (BP) and decreases blood and urine flows, as well as sodium excretion . In both animal models and humans, increased blood pressure has been associated with oxidative stress in the vasculature. This excessive endothelial production of reactive oxygen species (ROS) may be both a cause and an effect of hypertension. Apart from NADPH oxidase, nitric oxide synthase, lipoxygenases, cyclo-oxygenases, xanthine oxidase and cytochrome P450 enzymes, mitochondria also could be considered a major source of reactive oxygen species (ROS): in situations of metabolic perturbation, increased mitochondrial ROS generation might trigger endothelial dysfunction, possibly contributing to the development of hypertension. However, the use of antioxidants in the clinical setting induced only limited effects on human hypertension or cardiovascular endpoints . Antihyper-tensive treatment aims to reduce not only blood pressure values but also hypertension-induced organ damage and as a consequence morbidity and mortality. Reports have demonstrated that lowering blood pressure leads to reduction of oxidative stress [22,23]. In a study conducted by Saez et al. , antihypertensive treatment for three months significantly reduced oxidized/reduced glu-tathione ratio and malonaldehyde, significantly increased the activity of superoxide dismutase and catalase. The changes were independent of the kind of antihypertensive treatment (non-pharmacologic, β blockers or angiotensin receptor blockers) and the beneficial effect of treatment increased over time . However, in a study conducted recently, antioxidant supplementation (vitamin C and vitamin E) in a group of preeclamptic women did not result in a reduction in blood pressure . In the present study, the elevated blood pressure returned to normal levels after delivery, but lipid peroxidation was still higher than normal levels. This suggests that factors other than oxidative stress may contribute to the development of hypertension in preeclampsia. Oxidative stress and progression of renal injury: Pree-clampsia and eclampsia are associated with impaired re-nal function, reduced renal perfusion and glomerular filtration . This may be attributed to intrinsic renal changes caused by severe vasospasm. There is considerable evidence suggesting that reactive oxygen species (ROS) are implicated in the pathogenesis of ischemic, toxic and immunologically mediated renal injury . In experimental immune glomerulonephritis, reactive oxygen species (ROS) are generated by polymorphonuclear leucocytes, monocytes and glomerular mesangial cells. Their formation results in morphologic lesions and in modification of glomerular permeability to proteins through activation of proteases and reduction of pro-teoglycan synthesis . In the present study, both lipid peroxidation and protein excretion remained elevated after delivery in preeclamptic women compared to pregnant antenatal cases. Recently, administration of antioxidants to preeclamptic women resulted in the decrease in magnitude of proteinuria . These findings favor the role for oxidative stress in the causation of target tissue damage such as renal injury. Ceruloplasmin and oxidative stress and inflammatory response: Ceruloplasmin is a major contributor to the antioxidant defense system of human serum. Ceruloplas-min acts as an antioxidant by several mechanisms like inhibiting iron-dependent lipid peroxidation and hydroxyl radical (HO•) formation from hydrogen peroxide (H2O2) via its ferroxidase activity, reacting with and scavenging H2O2 and superoxide anion and by inhibiting copper-induced lipid peroxidation by binding copper ions . Ceruloplasmin can also function as a pro-oxidant and can oxidatively modify low density lipoproteins (LDL) in vitro . There are conflicting results for ceruloplasmin levels and its ferroxidase activity in preeclampsia. Recently, elevated ceruloplasmin levels were found in normotensive pregnant women as well as preeclamptic women . Women with preeclampsia showed significantly higher levels of serum ceruloplasmin. Nevertheless, the ferroxi-dase activity is not significantly higher when compared to that of women with normal pregnancy. This suggests that the ferroxidase activity of ceruloplasmin may be dysfunctional in preeclampsia . In another study, the ferroxi-dase activity of ceruloplasmin was significantly lower in women with normal pregnancy compared to non-pregnant women . Both these studies have limited number of cases compared to the present study. In our study, oxidase activity is significantly increased in preeclamptic women compared to pregnant women. The oxidase activity is moderately increased in pregnant women with concomi-tant moderate increase in lipid peroxidation in pregnant women in the present study. Thus, dysfunction of antioxi-dant role of ceruloplasmin may not be the underlying mechanisms for enhanced oxidative stress in preeclamp-sia. Normal pregnancy is characterized by a mild systemic inflammatory response, especially in the second half of pregnancy. Redman et al. , propose that preeclampsia develops when the systemic inflammatory process, common to all women in the second half of their pregnancies, causes one or other maternal system to decompensate . Preeclampsia may not be a separate condition but simply the extreme end of a range of maternal systemic inflammatory responses engendered by pregnancy itself . As ceruloplasmin is an acute-phase protein, a high serum ceruloplasmin level can be a reaction to systemic inflammation associated with preeclampsia. In the present study, significant correlation was found between the increase in uric acid levels and ceruloplasmin in preeclamp-tic women. Since uric acid has been shown to induce inflammatory response  and ceruloplasmin is also considered as acute phase inflammatory response marker , increased ceruloplasmin levels are suggestive of exaggerated inflammatory response in preeclampsia. To conclude, normal pregnancy is associated with a moderate increase of oxidative stress whereas the increase is marked in preeclampsia. The increase in lipid peroxidation is not significantly correlated to increase in the acute phase reactant ceruloplasmin levels but is significantly correlated to the systolic blood pressure and urine protein excretion in preeclampsia. Oxidative stress has been shown to be the causative factor for hypertension as well as causative factor for target tissue damage in hypertension. A concomitant increase of uric acid and ceruloplas-min in the sera of patients is suggestive of exaggerated inflammatory response in preeclampsia. In the present study, the blood pressure returned to normal levels during the post partum period but lipid peroxidation and protein excretion to did not return to normal levels. This is may be due to factors other than oxidative stress that are responsible for causation of hypertension in preeclampsia. It also implies that oxidative stress plays a very important role in the causation of target tissue damage such as renal injury. Further studies may clearly demonstrate the role played by oxidative stress in preeclampsia. I am extremely grateful to Dr. Vasudha KC, Professor & Head, Department of Biochemistry, M.S.Ramaiah Medical College, Bangalore, for her constant support and encouragement. I am also thankful for the statistical analysis done by Dr. K.P.Suresh, Scientist (Biostatistics), NIANP (ICAR), Bangalore. Sibai BM. Hypertensive disorders of pregnancy: the United States perspective. Current Opinion in Obstetrics and Gynaecology 2008, 20: 102-106. Garovic DV, Hayman SR. Hypertension in pregnancy: an emerging risk factor for cardiovascular disease . Nature Clinical Practice Nephrology. 2007; 3 (11): 613-622. Roberts JM. Endothelial dysfunction in preeclampsia. Semin Reprod Endocrinol.1998; 16: 5-15. Redman CW, Sargent IL. Latest advances in understanding preeclampsia. Science. 2005; 308: 1592-1594. Hung TH, Burton GJ. Hypoxia and reoxygenation: a possible mechanism for placental oxidative stress in preeclampsia. Taiwan J Obstet Gynecol. 2006; 45 (3): 189-200. Kolusari A, Kurdoglu M, Yildizhan R, Adali E, Edirne T, Cebi A, Demir H, Yoruk IH. Catalase activity, serum trace element and heavy metal concentrations, and vitamin A, D and E levels in preeclampsia. J Int Med Res. 2008; 36 (6): 1335-1341. Regan CL, Levine RJ, Baird DD, Ewell MG, Martz KL, Sibai BM, Rokach J, Lawson JA, Fitzgerald GA. No evidence for lipid peroxidation in severe preeclampsia.Am J Obstet Gynecol. 2001; 185 (3): 572-578. Srivatsan R, Das S, Gadde R, Manoj-Kumar K, Taduri S, Rao N, Ramesh B, Baharani A, Shah K, Kamireddy SC, Priyatham G, Balakumaran TA, Balakumaran SS, Kamath A, Rao A.Antioxidants and Lipid Peroxidation Status in Diabetic Patients with and without Complications. Arch Iran Med. 2009; 12 (2): 121-127. National High Blood Pressure Education Program Working Group on High Blood Pressure in Pregnancy. Report of the National High Blood Pressure Education Program Working Group on High Blood Pressure in Pregnancy. Am J Obstet Gynecol. 2000; 183 (1): S1-S22. Draper HH, Hadley M. Malondialdehyde determination as index of lipid peroxidation. Methods Enzymol. 1990; 186: 421-431. Varley H, Gowenlock AH, Bell M. Iron, copper and zinc in chapter 26 in Practical Clinical Biochemistry. William Heinemann Medical Books Ltd. 5th ed, 1980; 927-951. Chaturvedi S, Jain N, Bhatia A. Evaluation of semi quantitative methods for protein and sugar estimation in urine. Indian J of Pathol Microbiol. 2001. 44 (4); 399-401. Rosner B. Fundamentals of Biostatistics. 5th Ed, Dux-bury.2000. Kaur G, Mishra S, Sehgal A, Prasad R. Alterations in lipid peroxidation and antioxidant status in pregnancy with preeclampsia.Mol Cell Biochem. 2008; 313 (1-2): 37-44. Chamy VM, Lepe J, Catalán A, Retamal D, Escobar JA, Madrid EM. Oxidative stress is closely related to clinical severity of preeclampsia. Biol Res. 2006; 39 (2): 229-236. Ulker S, McMaster D, McKeown PP, Bayraktutan U. Impaired activities of antioxidant enzymes elicit endothelial dysfunction in spontaneous hypertensive rats despite enhanced vascular nitric oxide generation. Cardiovasc Res. 2003; 59 (2): 488-500. Girouard H, Chulak C, Wu L, Lejossec M, de Champlain J: N-acetylcysteine improves nitric oxide and a-adrenergic pathways in mesenteric beds of spontaneously hypertensive rats. Am J Hypertens 2003; 16: 577-584. Makino A, Skelton MM, Zou AP, Cowley AW Jr: Increased renal medullary H2O2 leads to hypertension. Hypertension 2003; 42: 25-30. Puddu P, Puddu GM, Cravero E, Rosati M, Muscari A. The molecular sources of reactive oxygen species in hypertension. Blood Press. 2008; 17 (2): 70-77. Troost R, Schwedhelm E, Rojezyk S, Tsikas D, Frolich JC. Nebivolol decreases systemic oxidative stress in healthy volunteers. Br J Clin Pharmacol 2000; 50: 377-379. Donmez G, Derici U, Erbas D, Arinsoy T, Onk A, Sin-del S, Hasanoglu E. The effects of losartan and enala-pril therapies on the levels of nitric oxide, malonalde-hyde and glutathione in patients with essential hypertension. Jpn J Physiol 2002; 52: 435-440. Saez GT, Tormos C, Giner V, Chaves J, Lozano JV, Iradi A, Redon J. Factors related to the impact of anti hypertensive treatment in antioxidant activities and oxidative stress by- products in human hypertension. AJH. 2004; 17: 809-816. Spinnato JA II, Freire S, Pinto e Silva JL, Cunha Rudge MV, Martins-Costa S, Koch MA, Goco N, Santos CDB, Cecatti JG, Costa R, Ramos JG, Moss N, Sibai BM. Antioxidant therapy to prevent preeclampsia: A randomized controlled trial. Obstet Gynecol 2007; 110: 1311-1318. Sharon E. Maynard and Ravi Thadhani. Pregnancy and the Kidney. J Am Soc Nephrol 2009; 20: 14?22. Chesley LC. Diagnosis of preeclampsia. Obstet Gynecol. 1985; 65: 423-428. Chappell LC, Seed PT, Briley AL, Kelly FJ, Briley A, Hunt BJ, Jones SC, Mallet A, Poston L. Vitamin C and E supplementation in women at risk of preeclampsia is associated with changes in indices of oxidative stress and placental function. Am J Obstet Gynecol. 2002; 187: 777-784. Healy J, Tipton K. Ceruloplasmin and what it might do. J Neural Transm. 2007; 114 (6): 777-781. Fox PL, Mazumder B, Ehrenwald E, Mukhopadhyay CK. Ceruloplasmin and cardiovascular disease. Free Radic Biol Med. 2000; 28 (12): 1735-1744. Orhan HG, Ozgunes H, Beksac MS. Correlation between serum malondialdehyde and ceruloplasmin activity values in preeclamptic pregnancies. Clin Biochem. 2001; 34 (6): 505-506. Louro MO, Cocho JA, Tutor JC. Assessment of copper status in pregnancy by means of determining the specific oxidase activity of ceruloplasmin. Clin Chim Acta. 2001; 312 (1-2): 123-127. Bainbridge SA, Roberts JM. Uric acid as a pathogenic factor in preeclampsia. Placenta. 2008 Mar;29 Suppl A: S67-72. Correale M, Brunetti ND, De Gennaro L, Di Biase M. Acute phase proteins in atherosclerosis (acute coronary syndrome). Cardiovasc Hematol Agents Med Chem. 2008; 6 (4): 272-277.